These condos in North Myrtle Beach, SC are well maintained. They are bright and sunny spaces thanks to the sliding glass doors that open to the balcony. Fresh air and sea breezes are right outside of your North Myrtle Beach condominium when your family vacations at Bermuda Run in the Cherry Grove section of North Myrtle Beach, South Carolina. The balcony in each of these condos in North Myrtle Beach, SC is accessed through the living room and the master suite. All of the balconies overlook the sparkling blue swimming pool at Bermuda Run. These North Myrtle Beach rentals really do live like home. The two bedrooms are tastefully decorated and private, allowing your family to spread out a little bit during your North Myrtle Beach vacation. The kitchens have everything you need to make snacks and meals and the biggest blessing might be the refrigerator so you do not have to live out of a cooler for the duration of your North Myrtle Beach vacation. There is also a dishwasher in the kitchen so clean up is quick and easy and you can hurriedly move on to something more fun than doing the dishes. Some of these condos in North Myrtle Beach, SC have Internet access while all of them have at least one DVD player and numerous televisions. Watch a movie during your North Myrtle Beach vacation at Bermuda Run; it is a nice way to settle down after playing hard all day long. Furthermore, each of these North Myrtle Beach condominiums boasts a washing machine and clothes dryer for your convenience. On site at this North Myrtle Beach resort, in addition to the pool area and clubhouse, is a place where your family can cook out. A grill is provided for your North Myrtle Beach vacation and you just might want to take advantage of this amenity. The smell of burgers or steaks sizzling on the grill while under the setting North Myrtle Beach sun is quite pleasant. Or if you have gone fishing during your stay at Bermuda Run you can cook up your own fresh catch of the day. What picture-perfect memories a North Myrtle Beach vacation cook out can provide. The North Myrtle Beach vacation rentals at Bermuda Run are non-smoking. 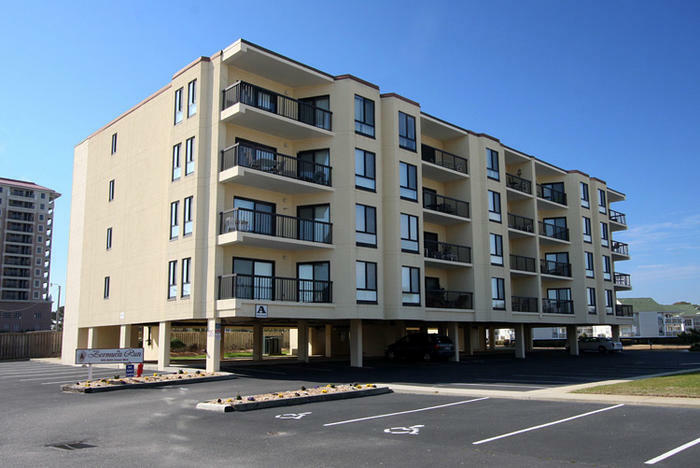 Breathe in the fresh air of the sea while enjoying views from your private balcony at these North Myrtle Beach condominiums. Your family can admire the East Coast sunrise and a North Myrtle Beach sunset from these balconies. What a peaceful retreat! When you spend your North Myrtle Beach vacation at this resort in the Cherry Grove section of town you will be closely located to all the fishing, live entertainment theatres, shopping, dining and amusements you can imagine. Enjoy the centrality of this North Myrtle Beach resort so you spend less time driving from amusement to attraction and more time riding roller coasters, zipping down water slides and cruising the ocean on a Sea Doo. The fishing around North Myrtle Beach, SC is wonderful. There are so many places from which you can fish including the river banks, shoreline, fishing piers, head boat and even offshore on a deep-sea fishing charter. The number of live entertainment theatres around Myrtle Beach exceeds the number of nights you would spend at Bermuda Run during a week-long North Myrtle Beach vacation. Touring productions grace the stage at The Palace Theatre while the Alabama Theatre and The Carolina Opry feature resident shows that are award-winning and family-friendly. Legends in Concert will have you singing to your favorite musicians of yesteryear and Pirates Voyage and Medieval Times are dinner theatres that offer a show and dinner. House of Blues, Ghosts and Legends Theatre and Dino’s Variety Show are also part of the live entertainment theatre landscape around the Myrtle Beach area. Hit the malls, stores and outlet centers around North Myrtle Beach, SC and go home with a myriad of fashion, home décor and North Myrtle Beach vacation souvenirs. Do all of your Christmas shopping while enjoying your North Myrtle Beach vacation and everyone will be pleased with what Santa brings them this year. Be sure to visit Barefoot Landing and Broadway at the Beach where shopping, dining and entertainment combine for a one-stop attraction in the Myrtle Beach area. After a day of hitting the sales and filling your bags, get something delicious to eat at one of the more than 1,500 restaurants around town. Dine on seafood and tour the world with international cuisine or just get a soup and salad on the waterfront to curb your appetite. Whatever you desire and wherever you want to go, Bermuda Run is in the middle of it all.